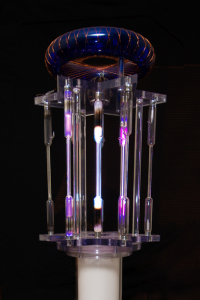 The Quantum Pulse is based on proven technologies and theories pioneered by scientists. We believe the Quantum Pulse can promote and support general well-being. The Quantum Pulse works on several different levels by using an electromagnetic field. In this field, a high voltage pulse is added along with ozone. The charge is placed at a negative voltage which is being transmitted to an antenna designed to twist the magnetic field. It is then routed through noble gases. What we are finding is that it depends on your state of mind, and most importantly, your intent. “Intent” is defined as “a conscious plan”. Therefore, whatever you put into your time spent with this machine… whatever your conscious plan is at the time… will be what you ultimately experience. It could range from inner peace and profound enlightenment to merely a non-destructive energy. It’s for you to decide… to create your own plan. What is suitable for one person may not be appropriate for another. What is important is for each of us to find the tools we require and to take advantage of them.